You know there is nothing quite like the cozy warmth of wood burning fireplaces, and no other fireplace system will warm you like an Acucraft system. It’s heat you control, and efficiency you will appreciate. With an Acucraft system, you will dramatically reduce your utility charges. Our Lifetime Warranty is unique in our market, but it shows our firm commitment and belief in our fireplace systems. Read our blog to learn about maximizing your wood burning performance! A single-sided fireplace that stands the test of time! The Hearthroom Series Zero Clearance Fireplaces offer an expansive arched or rectangular viewing area and the signature Acucraft quality and craftsmanship! A high quality single-sided fireplace! The Hearthroom Series Zero Clearance Fireplaces offer an expansive arched or rectangular viewing area and the signature Acucraft quality and craftsmanship!. Have Questions About Our Fireplace Products? Contact Us! 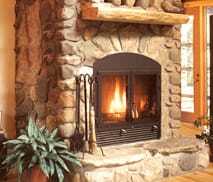 We have Fireplace Specialists available to answer any questions you may have about our fireplace products. Please give us a call at 888.123.4567 or visit our Contact page.